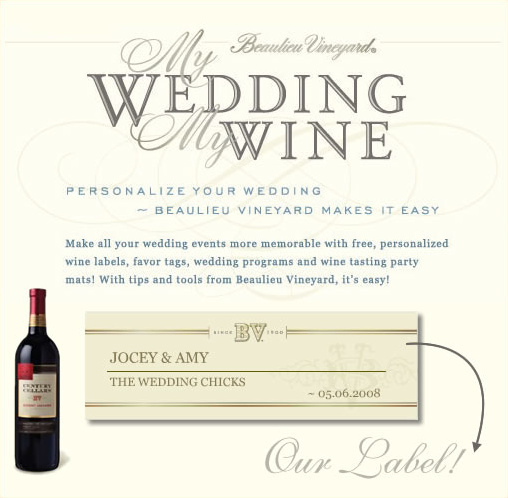 Impress your guest with personalized FREE wine labels created especially for you. You can also design a wine tasting party mat, wedding program and favor tags. Those items will have to be printed at home. Did we mention it was FREE! It only takes a moment to personalize the most memorable items on your table with the Beaulieu Vineyard My Wedding My Wine program. Simply select a message and customize your design, then place your FREE label order. How easy is that? We love the concept of of anything personalized. Those little touches make all the difference in the world. Check out myweddingmywine.com for more details.